GCT asks: What’s going on at the ‘House on the Cliff”? GALION — Something is wrong at the “House on the Cliff,” and its occupants want to know if the reported haunting is true. Overlooking a northern Great Lake, the house is believed to have been a stop on the Underground Railroad, active in the Civil War era. Lovely heiress Ellen Clayton ( Erin Shawk) is wheelchair bound, and attended to by Dr. Lane (Scott Tinnermeir) . They share the house with Ellen’s stepmother Karen (Cheryl Russell), and housekeeper Jenny (Nancy Green). Miss Pepper (Kelly Mann) arrives to put things in order, and assist Dr. Corey Phillips (Eric Palmer), a recent replacement in Ellen’s care regimen. Dr. Phillips believes Ellen should be able to walk. When a sudden and chilling murder occurs, the occupants of the house live out a mystery involving underground tunnels, sliding doors and a secret staircase. There is an unknown man who appears … apparently from the waters below the cliff. Romance and comedy ensue, baffling the residents and the audience. 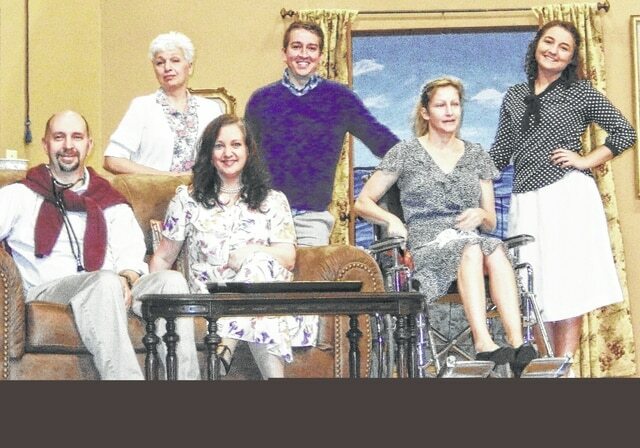 The “House on the cliff” is playing this weekend and next at Galion Commity Theater. Under the direction of Sandy Baldy Hoffer, this thriller will be staged Friday, Feb. 17, Saturday, Feb.18, Friday, Feb. 24, and Saturday, Feb. 25, at 8 p.m. The final performance will be Sunday, Feb. 26, at 2 p.m. Tickets may be purchased in advance via the theatre’s website www.galiontheatre.org, or by calling the box office at 419-468-2662. Tickets are $12 each. Presentation of “House on the Cliff” is supported by the generosity of corporate sponsors: First Federal Bank of Ohio, Geyer’s Super Valu and Mark A. Schneider-Gompf Funeral Home.